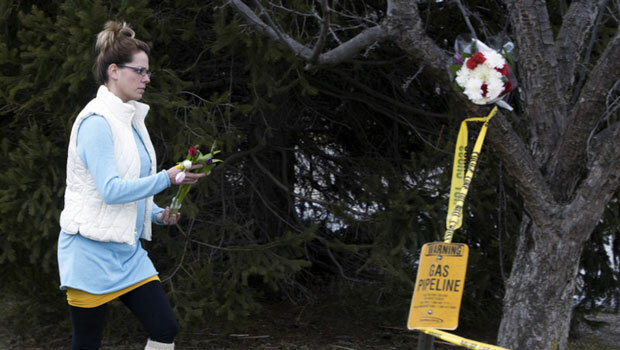 A woman places flowers at a Cracker Barrel restaurant where people were gunned down in the parking lot amid an hours-long shooting spree in Kalamazoo, Mich.
Victims of a shooting spree are being mourned in Kalamazoo, Mich., where Jason Dalton, the man suspected of killing six people Saturday, is expected to be arraigned Monday. Police have been trying to determine a motive for what seem to be random attacks. Eerie details have emerged about the case — including a witness&apos;s account of getting an Uber ride from Dalton, 45, who was a driver for the ride-hailing service. The witness tells NPR that he rode with Dalton shortly before the suspect was arrested in the center of town — and that they briefly discussed the shootings. "Dalton was driving for Uber that night and stopped after midnight to pick up Derek — who asked NPR to only use his middle name because he&apos;s afraid of retribution from speaking about his encounter," NPR&apos;s Hansi Lo Wang reports. That encounter occurred after midnight, more than six hours after the first of three shootings — and during a manhunt that had police on the lookout for a Chevrolet like Dalton&apos;s.
"And his response wasn&apos;t like you would expect, like a laugh. It was just very calm and quiet. It was, &apos;I&apos;m just tired. No, I&apos;m just tired.&apos; "
Dalton was arrested about a half-hour later, Hansi reports. On Sunday, Uber confirmed that Dalton was a driver and had passed the company&apos;s background check. Police have said he did not have a criminal record. Michigan State Police believe Dalton is the man who fired around 10 shots outside an apartment complex around 5:42 p.m. ET, wounding a woman who is now listed as being in serious condition. That woman, whose name hasn&apos;t been released, is "a hero," Kalamazoo Sheriff Richard Fuller tells local TV news WWMT. Explaining that she was in an area where several children were when the shooting started, Fuller says, "This person put themselves between the children and the shooter, right away." The violence continued more than four hours later, when a father and son — Richard Eugene Smith, 53, and Tyler Daniel Smith, 17, both from Kalamazoo — were shot and killed at the Seelye Ford Kia car dealership. That shooting was reported at 10:08 p.m. Minutes later, the third shooting was reported, at a parking lot of a Cracker Barrel restaurant. That&apos;s where police say four women were killed after two vehicles — a Chevrolet Cruze and an Oldsmobile Silhouette minivan — were fired upon. Barbara Hawthorne, 68, of Battle Creek, Mich. (rear passenger-side passenger of Chevrolet). A 14-year-old girl who was a passenger in the Chevrolet survived the shooting and was listed in critical condition late Sunday. Prayer vigils and remembrances were held for the victims last night. Gov. Rick Snyder has ordered Michigan&apos;s state buildings to fly the state and U.S. flags at half-staff for the next six days, to honor each of the six who died.